Nightgown, Undress, Negligée or Morning Dress? This post will mainly deal with the clothes worn at bedtime. Those are, of course, a part of Undress, which loosely referred to the more comfortable clothing, worn around the house. Some nightwear items, such as the cap and bed jacket, could also be part of Morning Dress. But more on that further below. Usually though, Morning Dress and negligées do not refer to sleep-wear, even though they are also part of Undress. They were usually worn around the house after getting up and before going back to sleep. This might also be why, nowadays, we sometimes call our nighties “negligées”. 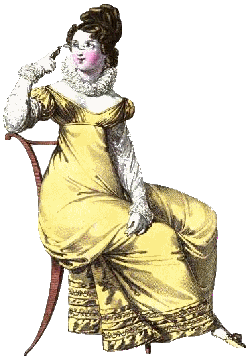 Back in the Regency era, however, the term referred to looser-fitting dresses for home wear. The frock pattern from Janet Arnold’s “Patterns of Fashion” is an example of a negligée. Because of the fine silver embroidery on the hem, though, even Janet Arnold was not entirely sure if this was really the case. But perhaps this dress belonged to a richer lady. As with everything, their morning attire was as stylish and fashionable as the rest of their wardrobe. I do not think this has changed much over the centuries. But, no matter how plain the Regency morning dress, it beats a baggy pair of tracksuit bottoms any day. Janet Arnold’s Regency negligée at the V&A. Soft wrap stays, found on The Dreamstress. If negligées were not worn in bed, then what was? The main garments were the bed shift and nightcap. But ladies often wore an extra layer on top, namely the bed, or night, jacket. Basically the bed shift or night shift was a type of chemise. It was made from plain linen or thicker cotton and worn by both men and women. As opposed to daytime chemises, which tended to ended a little below the knee, bed shifts usually reached a little lower, to somewhere between the calf and ankle. They could have long sleeves, as was the case up to the 18th century, but shorter sleeves were also common. In some cases, especially men also slept in their daytime shirts. One source, I do not quite recall which, also talked about ladies sleeping in their daytime chemises. Georgian / Regency bed shift, posted by Hope A. Greenburg. But usually, the shift was not the end of the story. As bedrooms tended not to be heated at night, especially women usually wore at least one extra layer on top of it. In the painting you can see a late-eighteenth-century lady in her bedtime finery. In the early Georgian and Regency eras, she might have worn the same amount of garments, but made up to be lighter and less voluminous. “Mrs. Wheatley Asleep” by Francis Wheatley (1790s). Since sleeping in the cold is never fun, and for modesty’s sake, Regency ladies wore a bed jacket on top of the shift. It was a loose-fitting, shirt-like cotton or linen jacket. I managed to find two extant examples on the internet, the one in the picture and another on Historikal Modiste. Both are tied at the neck and gathered a little at the back. They also feature a wide collar to keep the throat and chest covered at night. Sometimes, bed jackets were also worn in place of dressing gowns around the boudoir. Hence they had a little overlap with garments worn for Morning Dress. Extant Regency bed jacket, found on Vickiegarden.com. 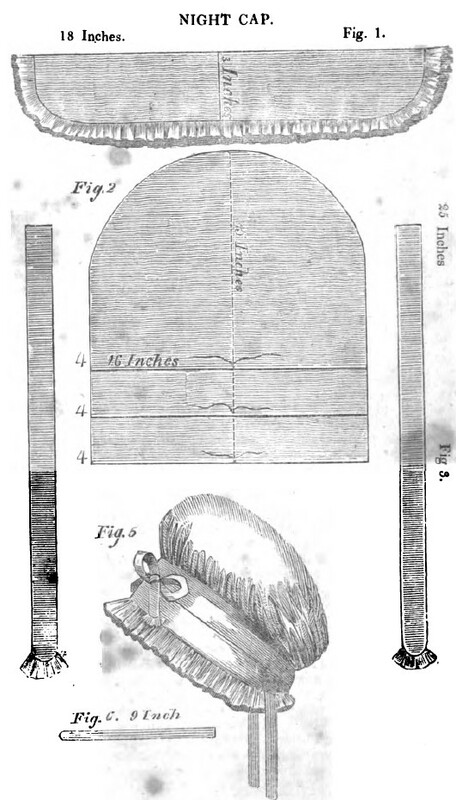 To keep the head warm, and to keep the hair in order, at night, night caps were worn. As opposed to the boudoir cap I made, they rather resembled mob caps, often tied around the top. “The Female’s Friend”, a domestic periodical from the 1830s-1840s, features a night-cap pattern very similar to the Regency style. It is available for free on Google Books. When the hair had survived the night, still looking presentable, the lady took off her night-cap. If not, she kept it on, exchanged it for the boudoir cap or tamed her mane with a cloth headband. To cover the hair while dressing or to hide the day’s hairdo while setting, a boudoir cap was worn as well. Night cap pattern from “The Female Friend” (1837). This was the gist of what I have found in my project research. I hope it was helpful. Maybe you even learned a few things about the Regency era you always wanted to know. If you are intrigued and want to know more about period bed and boudoir attire, feel free to have a look at the list of sources at the bottom. :) Now that I have filled you in on the historical background, I will start blogging about the two cozy nightwear items I am working on and their make up. The linen shift should be finished soon and then the bed jacket will follow. Please stay tuned. An overview of morning dress by Candice Hern. An overview of 1790s ladies’ night shifts by Joanna Bourne. Explanations on Regency nightwear and an extant bed jacket on Historikal Modiste. The latter source also featured a few helpful quotations from ”The Lady’s Strategem” by Frances Grimble. Interesting read. Question: isit possible that the jacket was done in wool for winter time? Sadly I have not found much on the materials used. But, since the extant jackets were muslin or linen and since nightwear was rather close to underwear, I would say wool was rare. For winter wear, the use of a thicker linen seems plausible.